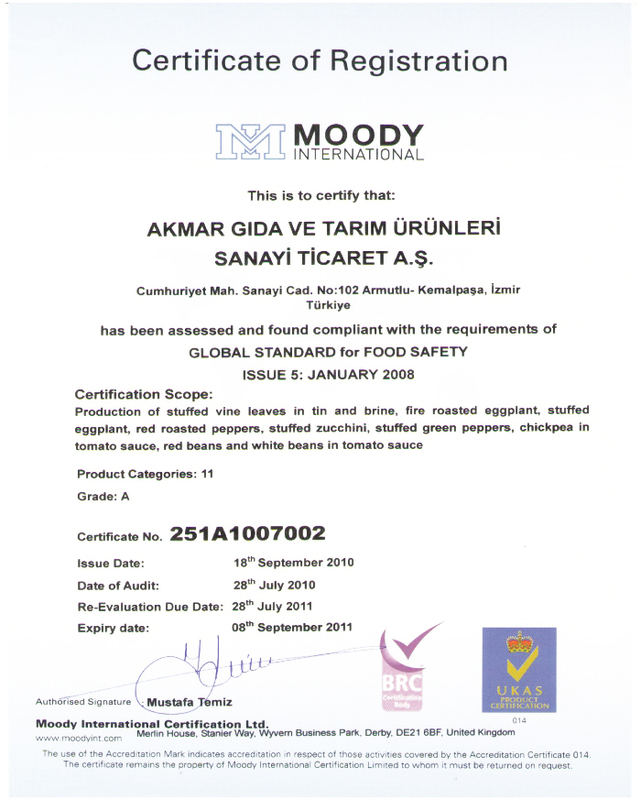 Akmar Food and Agricultural Products is amongst Turkey’s leading ready to serve companies, with excellence in quality and proficiency. As a beholder of 25 years experience and a variety of product line and recipes, Akmar is providing its worldwide customers with trustworthy solutions. Its services are processed from top to the bottom, from custom made recipes and packaging to the toll manufacturing or co-production facilities in desired amounts. Akmar produces retail and food size for different brands all over the world, and has its own brand. Having working for more than 10 countries today, Akmar is a gourmet on how to develop palatal delight. * Toll manufacturing in wanted can size; suitable for retail and food services. * All natural, preservative and cholesterol free products which suits vegetarian dining. All produced in hygienic conditions Akmar products guarantee the best taste in the Mediterranean and the Agean cuisine. Visit our products page for further details! 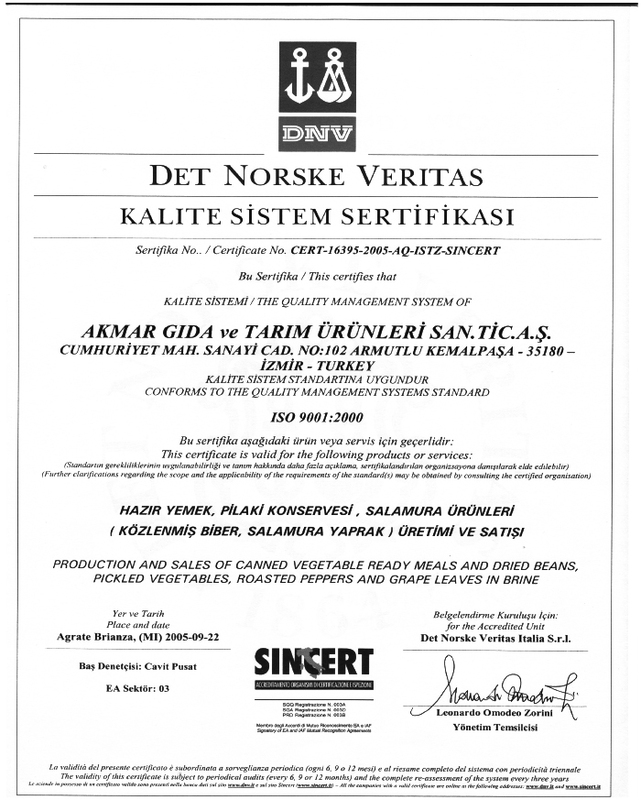 Akmar Company has started out as a joint venture in 1986, with the worldwide known delicious Aegean product, the stuffed vine leaves! The fame of this luscious taste has arrived soon and its production capacity has grown in the years that followed. Developing the most healthy and delicious Mediterranean food in ready to serve, Akmar became a leading manufacturing company for brands in Canada, USA, Saudi Arabia, Turkey, Germany… Akmar operates as one of the leading companies of the Akdemir Group that is based in the beautiful Aegean port Smyrna, (Izmir), Turkey. Akmar’s skilled food specialists and 120 employees guarantee the best taste, the healthiest food, and the sterile work contract! Performing checks on the cuisine, and keeping track of the production line, packaging and shipment for each customer, Akmar is proud to present its products that are easy to use, store and carry for your needs. 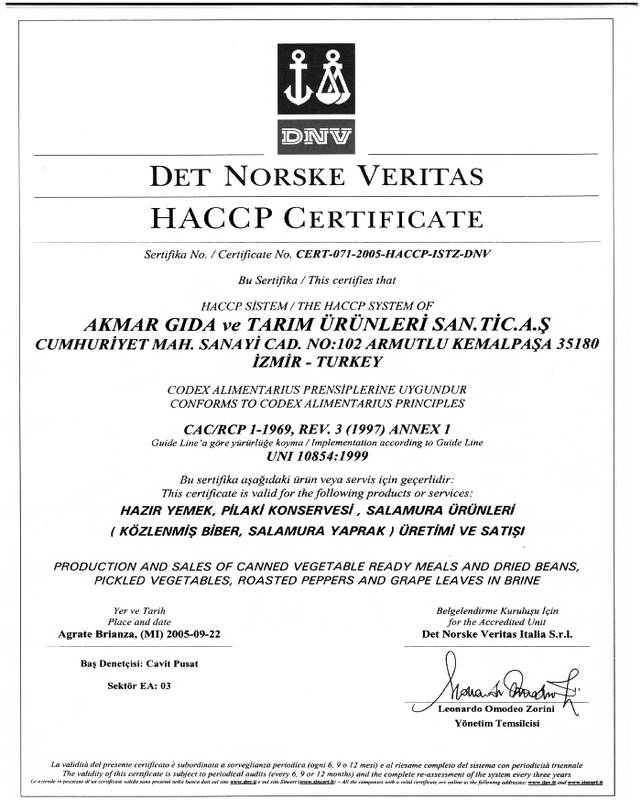 Akmar products are certified with ISO, HACCP and Quality BRC.